Are you looking for kids guitar lessons? This is your one-stop for reliable information and best value kids guitar lessons. At what age to start guitar lessons ? How to find the best teacher ? What kind of guitar to get ? What’s the cost of guitar lessons ? Perhaps you already know about the benefits of music lessons and are looking for the best quality tuition for your child… You’ve found it! 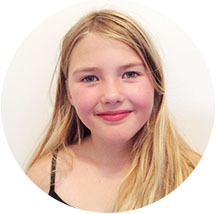 The Gentle Guitar™ lessons for kids are taught to you and your child one-on-one via Skype. You can be anywhere in the world and learn at your own pace from the comfort of your home. Gentle Guitar™ Skype lessons for kids work amazingly well for young beginners and advanced students. We have over 8 years experience working with families just like yours. But don’t take our word for it. Read what other parents are saying, then book a free trial lesson and see for yourself! Our teachers provide fun and professional kids guitar lessons designed for your child. Would you like to participate in the lesson alongside your child? At Gentle Guitar™ we encourage adult participation in the lessons. All you need is an Internet connection and a desire to give your child the best quality music education. The tipping point for us was that Gentle Guitar offered Skype lessons. It provided the most practical option that fits with our busy schedule. The best part is the time I get to spend with my son. I have always wanted to learn to play and now I have a great reason to achieve this and also bond with my boy. It feels like my son and I are in control and Gentle Guitar provides the guidance to keep us on track. We worked through the lessons with our instructor and Olliver was then able to carry on practicing at his own pace. He was so engaged he even started to teach his friends that came over for playdates. I love that Olliver was taught music in a simple, easy, effective manner without me rushing to get to a lesson. Skype works well and it is easy to learn with an excellent teacher. Skype lessons allowed me the ease of being on time every time without having to leave our home. I read an article about Gentle Guitar and it sounded like a great method to get inspired. The methodology of teaching children seemed different from just strumming chords. We decided to try Skype lessons because of the convenience and the fact that we were struggling to find time for driving to a lesson. We’ve been pleased with the variety of activities and lessons. In spite of my skepticism, we have been fully converted. Skype lessons work amazingly well! I was a bit sceptical (about Skype) but decided to give it a go and now love the convenience without compromising on the quality of teaching. Gentle Guitar is a more ‘traditional’ method that teaches children how to read music as well as how to play. Having all of the resources on tap and the clear, informative content has made lessons productive and practice much easier (than with previous teachers). Skype is a very convenient method for lessons. Work with a trained and experienced teacher who will instantly connect with your child. Your child will have fun, make fast progress, and look forward to each lesson. Gentle Guitar™ lessons inspire children to learn and explore his or her creativity though songwriting and musicianship. The lessons are available for two age groups: Ages 5½ to 8 and ages 9 to 12. Lessons are tailored to your child’s age and ability. Signing-up for a kids guitar lesson has never been easier! 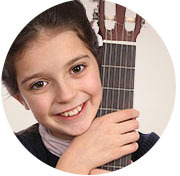 The Gentle Guitar program is taught to you and your child, one-on-one, via Skype. You’ll be on time every time and you won’t have to beat traffic and use up valuable time travelling to and from lessons. Instead you’ll invest quality time bonding with your child over a rewarding educational experience. Unsure about long-distance Skype learning? Give it a try, you’ve got nothing to lose! Also, read testimonials from other parents to see why they choose Skype tuition for their family. Gentle Guitar™ is a New Zealand company with the head office in Copenhagen, Denmark. 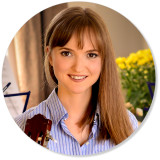 The company was founded in 2013 by Inga Hope, a trained guitar coach with over 8 years teaching experience. 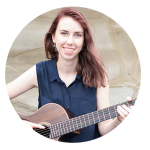 Inga created the Gentle Guitar Method™ to meet a growing need for convenient and effective kids guitar lessons tailored to young children. Gentle Guitar™ is growing fast with Skype lessons taught around the world in New Zealand, Australia, USA, UK, and Canada. Children between ages 5½ to 12, accompanied by a parent, family member or another adult. Families with no prior musical knowledge who would like to give their child (children) a quality music education. Families with musical experience who need a structured and flexible framework for teaching music to their child (children). 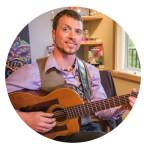 Homeschooling families who need a professional and flexible music curriculum that will fit with their schedule and can work on any budget. 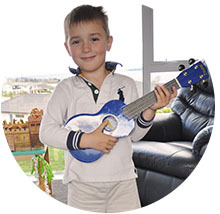 Busy families who need the flexibility to take music lessons from home or on the go. Families living in rural areas who would like access to professional high quality music education for their child (children). Shy children who need help thriving. Learning from home with a family member nearby, in a comfortable environment, with an expert who can give gentle guidance — is an ideal environment for shy children to really shine! Kids who need an academic boost. Most guitar schools and private teachers don’t teach music literacy to children. That’s a shame, because kids LOVE it and it gives the brain a super-workout! You and your child are guided, step-by-step. You explore music theory, correct guitar playing technique, songwriting, how to play songs and chords, how to read standard music notations, and overall musicianship. You and your child meet with your teacher once a week, live via Skype (or FaceTime). The lessons are 30min. You get a fun age-appropriate music workbook with exercises, songs and written activities. You are encouraged to do progressive daily guitar homework which only takes 10 – 15min to complete. The teacher guides you though the workbooks and lessons at a gentle pace that suits your child’s personality and learning ability. You get step-by-step instruction. Even if you don’t know ANYTHING about music, it’s easy to follow along and help your child learn. It’s a DEVELOPMENTAL program. It’s about using music as a TOOLBOX during those CRUCIAL YEARS in you child’s development when the brain is highly plastic between birth and about age 10. The Gentle Guitar™ lessons are designed to boost confidence, build self-esteem and teach universal skills required for success in any discipline. The Gentle Guitar™ lessons are compatible with the major international classical and modern guitar examination boards. Our international team of teachers is ready to cover your timezone! Wherever in the world you are, we’ll connect at a time that suits your family.